Super Bowl Sunday is tomorrow, and so, in honor of the 2 teams that are playing – the Broncos and the Seahawks, I will draw attention to the following video from CBN, who interviewed some of the Christian who will represent both teams in the Big Game. 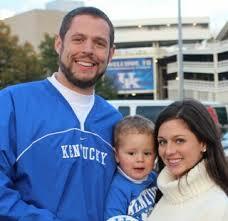 Broncos TE Jacob Tamme and family. From the Broncos, you heard from Tight End Jacob Tamme, who I blogged about last season, Linebacker Steven Johnson and Punter Britton Colquitt. And from the Seahawks, there was safety Chris Maragos, who I blogged about last season, Tackle Russell Okung, quarterback Russell Wilson, and long snapper Clint Gresham. There is a lot of good stuff in this video and there are some other resources that you should check out too. Here is a link to a story about Jacob Tamme talking about leaning on his faith when his wife was diagnosed with cancer last year, and also talking about the spiritual leadership of Peyton Manning for the Broncos. There is also a link also talks about the Seahawks players putting together an outreach video for the Superbowl called Making of a Champion. My takeaway thoughts I want to share come from the last player on each list – Colquitt and Gresham. 1- Nothing else satisfies – To win a Super Bowl Championship, or any championship at any level of sport is great. There are amazing feelings of accomplishment and satisfaction. There are bonuses, rings, parades, interviews, talk shows, banners. But the attention and the pomp doesn’t last forever. Within a couple of weeks, there is already talk about what the next season will bring, who the favorite teams are and what each team will need to do to be the champs. Britton Colquitt said it truthfully in his interview. He said” it would be awesome to win the Super Bowl”, but he goes on to say that those guys who have won the Super Bowl are still trying to win the Super Bowl. And all the happiness and satisfaction that it brings is fleeting and doesn’t last. That is like everything that this world offers. Money, stuff, status – it all is brief and fades. It can be easily taken away. But eternal life that comes from believing that God sent His son Jesus to deal with our sins and invite us to live forever with Him. That is forever! That is eternal! That is something that brings us not momentary happiness, but everlasting joy. Jesus death and resurrection won the victory for us that is the victory worth truly celebrating! 2- God gives us opportunities. How will we use them? – Clint Gresham echos those thoughts in his interview portion of the video as well. He talks about putting our identity in Jesus and not in the successes that we have that the world. He knows that the window he has for sharing who God is to Him with millions of people at a time is very brief. He says “Because one day football will be gone and one day people will not know who I am or care to interview me … If i put my value in the fact that someone wants to talk to me about football … life’s gonna not be that great” But when we begin to understand what Jesus has done for us, and we understand that there is nothing better than knowing Him (Philippians 3). then no matter where we are or what we are going through, we can know peace and joy that goes beyond ANYTHING this world offers. Enjoy the game and let me know who you are rooting for. And join me in praying for opportunities for them to share God’s love to the open ears that may hear them.